Does Anyone Actually Like Daylight Savings Time? Does anyone like Daylight Savings Time? With three kids I am excited when spring comes around and the sun starts shining. However, right after we “spring forward,” I struggle to get the kids out of bed. Don’t get me wrong. I love mornings. I’m one of those disturbed individuals that enjoys going to the gym at 5am. I also love the extended daylight in the evenings, so I am not advocating we do away with daylight savings. Au contraire, I say we don’t go back to standard time in the fall. I did some research on the subject. 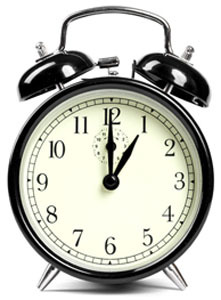 Daylight savings time was first proposed in 1895 by George Vernon Hudson (http://en.wikipedia.org/wiki/Daylight_saving_time). I am sure he had his reasons (like not enough candles) but that doesn’t mean we need to cling to this idea from more than 100 years ago. I loved my dad’s IBM Selectric too, but I can’t say the old typewriter has seen the tips of my fingers since the advent of word processing. As a child I lived in Arizona for three years and they never changed their clocks. Can we get California to adopt this idea? I would love to get comments and see how many people agree or disagree.